haunt, I'm happy to say that a new king has been anointed in these parts. Guasti Winery was chosen when Cotroneo and Pardini attended a wedding there. lights which emphasize richly themed portions of the exterior. you’ll get at least one good jolt. haunted attractions with budgets three times as big don’t always get right. always the mark of a good haunt. 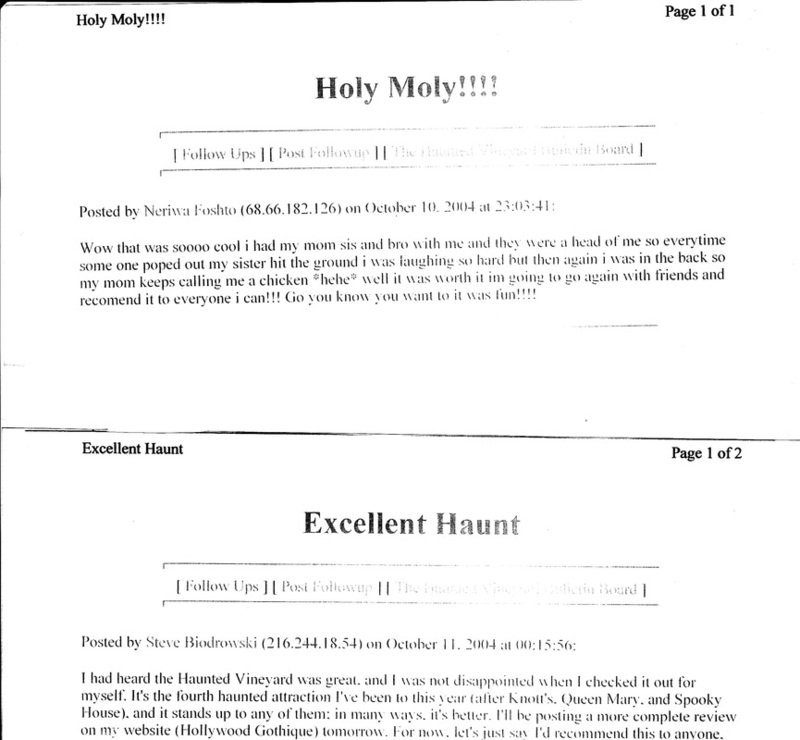 In its third year now, the Haunted Vineyard has developed a reputation as an excellent Halloween attraction, and this year's presentation fully lives up to the high praise heard from fans. The Haunted Vineyard is a stand-alone attraction with a single, excellent walk-through maze featuring wonderful atmosphere, great sets, and dozens of scares. Of the many mazes we've walked through this year (ten at Knott's Scary Farm, seven at the Queen Mary, three at Spooky House), this was the best single one; it was so good, in fact, we took advantage of the discount admission price ($5) for going through a second time. With so many other established haunted houses, you might wonder what this relatively new one has to offer. The most obvious point is that, despite being new, it is not trendy; in fact, the Haunted Vineyard is a world all its own. You won't find most of the familiar cliches seen at other haunts: no black-light 3D decorations, no strobe lights, no killer clowns, no mangled limbs and severed body parts, no ghoul in skintight black leotards painted to match the colors on the wall, and no pulse-founding techno music. Instead, you will find a wonderfully creepy and convincing series of set pieces that provide a maximum opportunity for exciting, thrilling, and above all fun scares. The first remarkable thing about the Haunted Vineyard is its location. As you drive to the haunt, you pass old dilapidated houses and a winery, then park in a dirt lot that makes you feel as if you're almost in the middle of nowhere -- or at least that you've left the safe, comfortable urban world behind and wandered into some dangerous backwoods nightmare. It's not quite TEXAS CHAINSAW MASSACRE, but it's close. You enter the grounds through a gate with a lighted sign above. To the left is a ticket booth; to the right are some other booths where you can buy merchandise or snacks, or have a souvenir picture taken, with one of the haunt's calendar girls (Miss November was on hand the night we went). After buying your ticket, you walk past the booths and some guards direct you around a corner, where a guide in a black robe informs you of the rules (they'll sound familiar to frequent haunt goers: "don't touch the monsters and they won't touch you," etc.) Then the ticket taker punches your ticket and you're on your own, wandering through a very long and elaborate maze. The interior sets make you feel as if you're in some demented back woods home where the residents went crazy long ago. The exterior scenes are even better, including an extremely detailed graveyard and a "cornfield" so overgrown that there's no telling where a monster may be hiding. Clearly, much thought went into finding imaginative ways to catch victims off guard. Upon occasion the monsters resort to the simple art of lurking around a corner, but more often they rely on innovative techniques. There are numerous trap doors that allow ghouls to appear almost out of nowhere. Some are crouched down low and/or camouflaged so that you walk right by them before they spring upon you. In one case, there's even a hole in the roof that allows a monster to reach down at you from above. And others have simply perfected the familiar art of standing so still that they look like statues -- until they attack. There are some simple but effective mechanical effects: props that look as if they are about to fall on your head -- just before they come to an abrupt stop with a loud CRACK that will send you jumping. There is also an extremely effective use of sound, with an emphasis on subtle recorded whisperings that seem to come at you from all directions, interspersed with louder, abrupt noises (like the aggressive caw of an unseen crow in the cornfield). It all ends with a last frantic chase toward safety, with a monster who appears from behind just when you think the maze is over. After that, you return the way you came, and you'll be tickled at how eager the haunt employees are to ask whether you enjoyed the show. This underlines one aspect of the Vineyard that sets it apart: it looks and feels like a small mom-and-pop operation. It may not be as high-tech as the more familiar theme park attractions like Knott's Scary Farm and the Queen Mary Shipwreck, but it has a personal kind of touch that makes it unique. After attending several other haunts this year, you may start to feel as if you're seeing variations on the same themes over and over, but the Haunted Vineyard really will strike you as different enough to justify the trek out to Ontario. 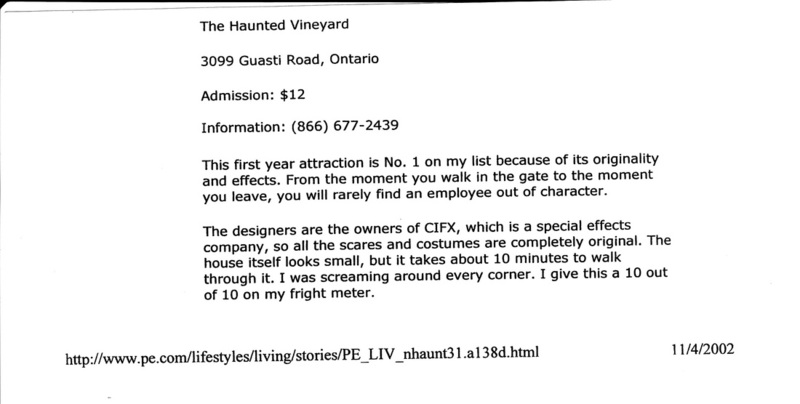 Obviously, the Haunted Vineyard is not the place to go if you're looking for an attraction that will keep you busy all night. However, if you're looking for something to do in between trick-or-treating and watching a late-night horror movie, this is the perfect entertainment. It's probably too frightening for smaller children, but teenagers should enjoy it, and it's imaginative enough to please older, more jaded haunt goers as well. We hope the Haunted Vineyard does well enough to continue for a long time to come. We definitely plan on going back next year.